At last, the cult books are on Netflix! But don’t smile – keep your tissues close by! This woeful saga starts with a death, and it’s downhill all the way from there. There will be no lucky twists of fate. No lighthearted laughter. Nothing but misery and misfortune. Forget happy endings! The Baudelaire children – Violet, Sunny and Klaus – have just been orphaned. What could be worse than being completely alone in the world? Only this: having an evil uncle, Count Olaf, who wants to destroy you and steal your family’s fortune! Best thing that ever happened me in my life!!!!!!!!!!!! Awesome! 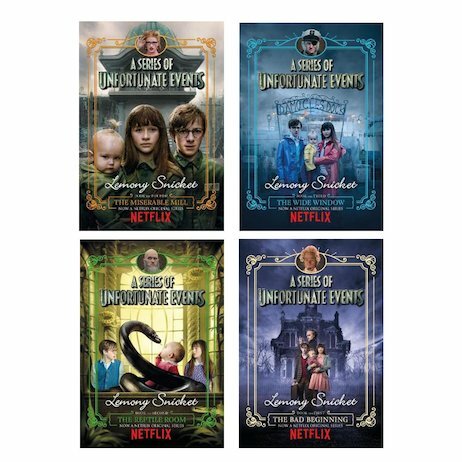 This TV version of A Series Of Unfortunate Events is just as clever, humorous, and gripping as the books! I would recommend this 100% to anyone who’s read the books, or is just looking for a GREAT telly show to devour from time to time ( or of course, watch all of them in one go! ). Either way, this show will make you wanting for more!